National Volunteer Week is the perfect time to introduce the two soon-to-be members of our VBE team: Stacy Raite and Kerry Ann Beal are currently in training to be VBEs! Stacy has been involved with BWI of Central NJ since the summer of 2013 and is excited to help spread the babywearing love as a VBE. Stacy’s an avid wrapper and credits her babywearing success on finding the chapter. Current go-to carrier: Wraps! Base minus 2 is my go-to. Dream carrier: One I currently have – monochrome with a galaxy dye in place of the nati fibers or, if a black and white version of the literary wrap I fell for is released, that dyed rainbow grad for a Reading Rainbow carrier! Best babywearing advice she’s gotten: Don’t give up and keep asking questions until you are wearing comfortably, safely, and confidently! Kerry has been attending BWI of Central NJ meetings since the summer of 2014. 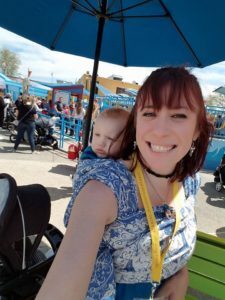 She found babywearing to be a lifesaver and is looking forward to pass on her knowledge to help other caregivers fall in love with babywearing, too. 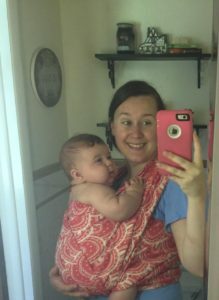 Current go-to carrier: It would be a tie between my toddler Tula and my wrap conversion Kanga XP. Dream carrier: My dream has been my own custom wrap converted carrier which I recently just received. It’s a Cari Slings Mithril wrap converted to a Bloo Kangaroo XP SSC. Best babywearing advice she’s gotten: Make sure to wear your hair up high since little toddlers love to pull at it when doing a back carry!